Designed for special applications, CMT models 1023 and 1058 numbering heads mark electronically generated alphanumeric random sequences. These numbering heads are remote selective, computer interfaceable, metal marking machines designed for rugged plant environments. 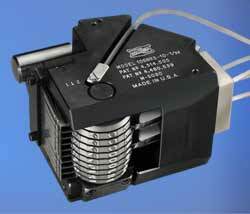 Model 1023 is a straight style numbering head, and 1058 is a convex numbering head. Both of these models feature an exclusive integral mark verification system.